Maybe it's a reaction to all the colorful tulips and daffodils blooming in pots around the city, but I'm in a decidedly monochromatic, minimalist frame of mind. Today, during New York Gallery Week I was taken by black and white. Well, that's what seemed to dominate when I looked over the shots I'd captured. 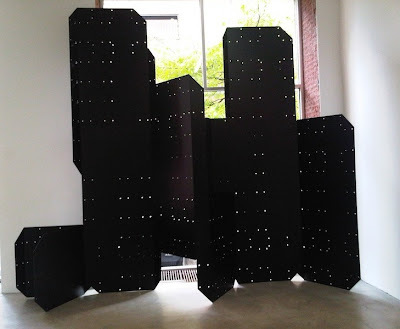 For example, I loved the menacing Meccano-like powdercoated, perforated panels bolted together by Czech artist Tobias Putrih in his show When Language Goes on Holiday at Muelensteen Gallery, above. Architecty and hard edge, it made me jones for an IKEA-antidote kitchen and bathroom made of it - dammit, make that the whole apartment. Check out the website of this Dutch-owned gallery (formerly Max Protech) and you'll see a special link for Architecture with all the great names - Frank Gehry doodles, Louis Khan scribbles ... and we know how much the Dutch love architecture. Read more about this show here.